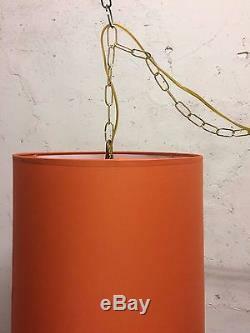 New contemporary/mid century modern style hanging lamp. Set up as a swag lamp with 12 foot of cord with plug on end. Operated by an on/off pull chain switch or you can leave switch in on position and control from a wall switch if your wall connection is set up that way. 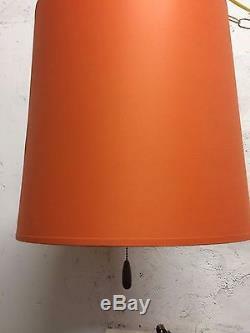 Orange color textured fabric with a white vinyl interior. Shade measures 14" w x 14" tall. 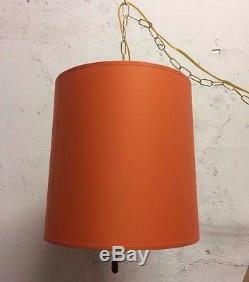 The item "Mid Century Modern Drum Shape Swag Fabric Hanging Lamp shade Plug in 14 w" is in sale since Friday, March 16, 2018. This item is in the category "Home & Garden\Lamps, Lighting & Ceiling Fans\Chandeliers & Ceiling Fixtures".